In Alaska, in January of 1925, a potentially deadly diphtheria epidemic was poised to sweep through Nome. However, the only serum which was able to stop the outbreak was in Anchorage, and the only aircraft with the ability to quickly deliver the serum had a frozen engine and was impossible to start. So it was finally decided to deliver the serum via multiple dog sled teams; a train transported the serum from Anchorage to Nenana and the first musher embarked on the mission. Over twenty mushers took part in the whole thing, facing blizzards, strong wind, and -23 °F weather. The event was covered in the news worldwide. 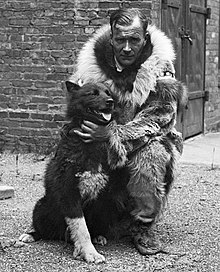 The famous story of Balto the sled dog is that he led the team who covered the distance into Nome on the second of February, 1925. Multiple films were made concerning the famous hero. However, what many people did not and do not know is that the longest and most hazardous stretch of the journey was actually accomplished by a totally different sled dog. But the people who witnessed Balto completing the journey were confused and thought that Balto had done most of the work. Thus his fame became huge and Togo was a more rare mention during the story of the 1925 serum-run to Nome. In fact, people are often unaware that there was more than one dog sled team at all. The story of Togo (named after a Japanese admiral), the agouti-furred offspring of Norwegian musher Leonhard Seppala’s former dog sled leader, Suggen, was that he was thought unfit to be assigned to work and didn’t have the potential for a proper sled dog. At six months of age, Seppala sent him away to a different owner to be a house pet. However, Togo jumped through the glass of a closed window and ran several miles back to the kennel of his original master. Impressed by the devotion Togo expressed, Seppala let the rambunctious ‘canine delinquent’ stay. Togo continued to cause mischief, especially by breaking out of the kennel, confronting oncoming dog sled teams and attacking the leaders. But, after being seriously mauled and injured by a stocky Malamute, he learned never to do so again. But Togo wasn’t done. He played with the working dogs and led them off the trails on charges against reindeer while they pulled the sled. Finally, Seppala had no choice but to put Togo in the harness, and to his surprise, Togo settled down; he proved his worth as a sled dog at eight months of age. Togo continued to be moved up the line until, at the end of the day, he was sharing the lead position with a dog named Russky. Togo had logged 75 miles on his first day in harness, which was unheard of for an inexperienced young sled dog, especially a puppy. Seppala called him an “infant prodigy”, and later added that “I had found a natural-born leader, something I had tried for years to breed”. And Togo was an infant prodigy. He led the team through many miles and dangerous types of weather to reach Nome but, after being replaced by Balto in the last leg of the journey, the misunderstanding took place. Balto’s remains were mounted by a taxidermist and exhibited in the Cleveland Museum of Natural History. Togo’s remains were taxidermied and mounted where visitors were actually able to pet him, resulting in the thinning and falling out of his fur. However, his remains were rescued and more well-preserved; today the mounted skin is now properly on display in a glass case in the Iditarod Trail Sled Dog Race Headquarters museum, and his skeleton was mounted separately and is now in possession of the Peabody Museum of Natural History. They’re heroes, and its good to give both of them credit for the crucial roles they played in saving lives, not to mention all of the other dogs and mushers, but I would think that Balto shouldn’t be the main collector of glory and fame. What a great story! Thanks for sharing this.